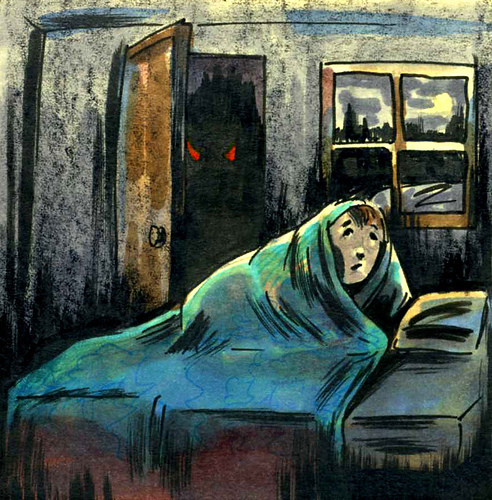 Almost every child at some time fears the monster in the closet. Well folks, we have a monster in our closet! Our monster is the thing that will ultimately reduce your government services and potentially impact the future viability of many local governments. For years, local government was not required to show their obligation to pay for retiree benefits on their balance sheets; thus, most decision makers were unaware of the future debt they were incurring. A few years ago that changed, when local governments were required to recognize their retirement debt obligation as part of their budgeting process. We are required to show the debt obligation; however, we are not required to account for how we plan to meet that indebtedness. It must be remembered that Plumas County is required to have a balanced budget each year, that balances expenditures with anticipated income / revenue. 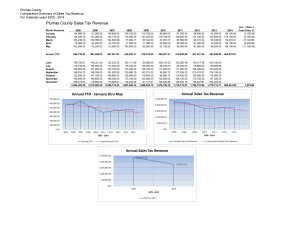 Past practice in Plumas County budgeting has been “pay as you go”; in other words, to estimate the current year’s requirement to pay for retiree benefits and build that into the budget, without looking to the compounding problem going into the future. Last year, for the first time, Plumas County set aside dollars to be placed in an investment account whose earnings will help to meet the retiree debt load. Due to extremely tight constraints, we were only able to establish an account with a small contribution; however, it is my intention to lobby heavily during this budget cycle for continuing to fund this account, if not to increase our contributions. If we do not recognize this obligation and begin addressing it now, we will be facing dire consequences going into the future. We will see a large portion of our County labor force retiring due to the aging out of the “baby boomer” generation, without the increased revenue to pay for that growing liability. This will be further compounded by the obligations toward funding staffing hired to replace them! This is not exclusively a local problem! Governments all over the United States are in the same boat. California is currently in a position where the average State retiree is receiving benefits that are far greater than the income the average citizen is currently earning. What part of this equation does not make sense? The Wall Street Journal recently published an article discussing the situation on a national level – How to Become a Public Pension Millionaire . In California, public employee unions are very strong; to the point that it becomes almost impossible for cities and counties to negotiate contracts that require workers to shoulder a greater portion of their retirement benefit contributions. Public pressure to maintain salaries and benefits for sheriff deputies, police and fire has compounded the problem. Over time, many local governments, including Plumas County, have negotiated contracts with employee unions that saw the employer paying a greater portion of the employees’ share (in some instances 100%) in addition to the employer’s contribution to the Public Employee Retirement System costs. This has created a situation that cannot be sustained! As it stands now, “it is truly a broken, unsustainable system…created with good intentions, yet with unfortunate consequences”. In future blogs, we will look at how this works, process and what must be done to fix it. We no longer have the luxury of “kicking this can down the road”! At the Board of Supervisors meeting on 11 March, I will be announcing a proposal for a new partnership with the USFS Plumas National Forest (PNF). For the past month I have been working with PNF Supervisor Earl Ford formulating a program to provide an economic infusion for our community. Tree plantation maintenance, trails restoration and facility work, clearing and hand piling. Road restoration, storm proofing, stream restoration, drainage repair, and grapple piling. This program is envisioned to run about 4 years, providing training and employment. Ultimately, it could infuse millions of dollars into our economy. While many of the details remain to be worked out, the potential for huge benefits to the people of Plumas County is great. An overarching agreement on the part of the County and the PNF is that we do not wish to use these funds to “grow government”; rather, to “grow jobs” in the community. The preliminary plan is for Plumas County to put out contracts based on a “Request for Proposal” type program, where contractors would be encouraged to submit proposals for accomplishment of various identified work elements. Plumas County would act as contract administrator. Today we had our “kick-off” meeting with the entire team; a very productive meeting at that. As you can well imagine, there are so very many details to be addressed, it is at times mind boggling. However, if successful, this could be a vehicle to change the economic climate in Plumas County! It will be a work in progress for some time – but what an exciting, challenging opportunity! Please check back as I will be blogging about our progress as details become available. This is the start of a series of blogs, over the next few months, on the intricacies of sound budgeting. I think it is important to remember that sound budgeting in good times or bad is critical to the fiscal security and welfare of Plumas County and our citizenry. As we all know, budgeting and living within that budget (within your means) is very hard during difficult economic times. Budgeting for local, state and Federal governments for the last six years has been trying to say the least. This is even more challenging in Plumas County because we are, by many accounts, still considered, even classified as frontier! We live in a rural, mountain community and therefore face more variables in both revenue (income) and expense (cost) than our urban cities and counties. Each year it seems our economy is impacted by an uncontrollable event or situation such as wildfires, smoke, too cold, too hot, too wet, too dry, no snow, too much snow, highway construction to name a few. Because it is so difficult to predict or anticipate that which will impact our economy and what that impact will be to revenue and expenses, maintaining adequate reserves and contingency funds is critical – fiscally responsible. The Board of Supervisors recently completed a midyear budget review with our departments reporting generally below budget expenditures. This is good news if it is real. More importantly, are revenues at or above projections? I have been looking at our revenue streams and the figures I am seeing are troubling. 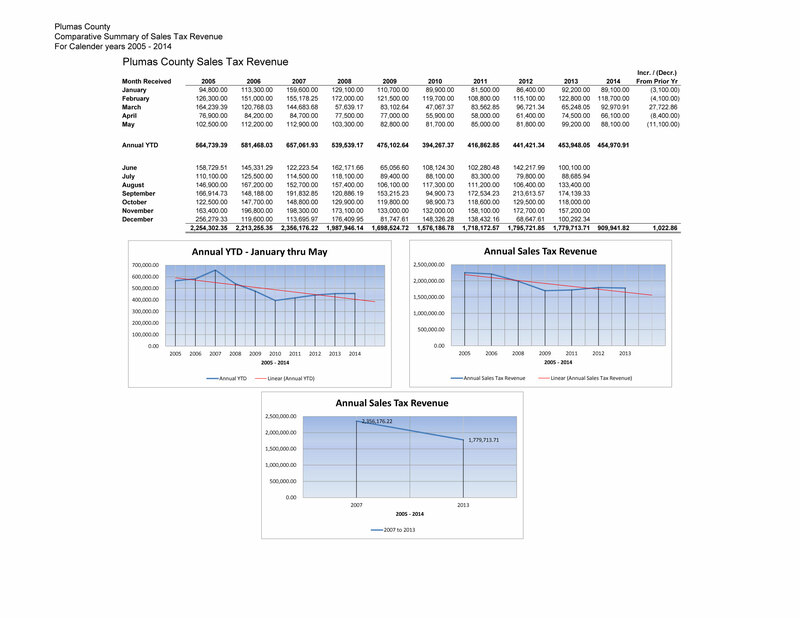 While property tax assessments are up, our Sales Tax and Transit Occupancy Tax (TOT) income is either flat or trending downward during a time when the media would have us believe the economy is greatly improved.